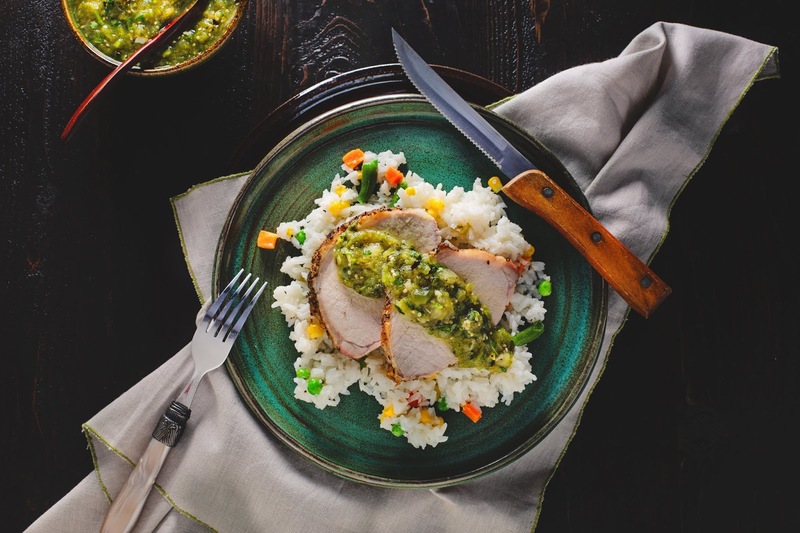 An elevated riff of traditional chile verde, this pork loin roast with salsa verde is elegant enough for a dinner party while also being versatile enough to feed picky kids and still satisfy hungry parents. Pork has been a staple of Mexican cooking since the Spanish Conquistador’s introduced domesticated animals in the 16th century. Even before the ad slogan professing pork as “the other white meat,” our family ate some form of pork on a weekly basis when I was growing up and I admit, I’ve carried that tradition on into adulthood. From mom cooking pinto beans with ham hocks then frying those beans in pork lard to my favorite soup, pozole made with pork neck bones. I mean really, can you imagine Mexican cuisine without the transformative experience of eating perfectly tender on the inside and crispy on the outside carnitas? Or the spicy tang of chorizo? How about achiote marinated cochinita pibil? Al pastor tacos made with thin cuts of marinated pork cooked on a spit that was adopted from Lebanese immigrants who brought shawarma to Mexico? I could go on and on and on … but I think you get the point. Pork loin is another family favorite eaten at holidays as a break from tamales. My father’s pork loin is always so tender and juicy. Though we never had apples with pork as so many Americans and Europeans are apt to do, we did eat it with sides like potatoes au gratin, green beans and corn. Leftovers were either eaten in sandwiches or drenched in spicy salsas eaten with fresh tortillas. 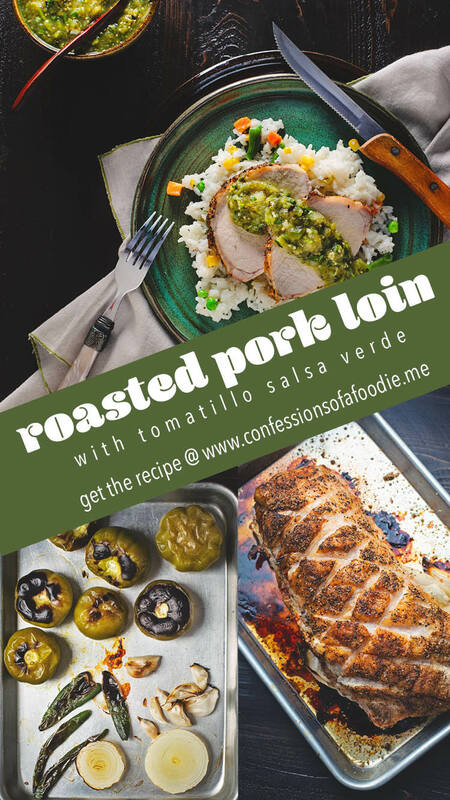 Today’s recipe skips the traditional way my family ate freshly roasted loin and goes straight to the pork and salsa combination. Tomatillos, with their acidic, citrusy notes, cut through the richness of pork loin much in the way that sweet and tart apples do if that is the way you’re used to having pork. 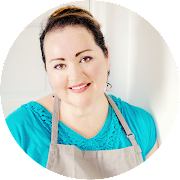 This recipe is an elevated riff of the classic puerco en chile verde – sometimes just shortened to chile verde – in which bite-sized pieces of pork are simmered in a tomatillo salsa. I came up with this version because I live with my auntie and she is not a fan of tomatillos. Or more specifically, unless it's mole, she isn’t a fan of Mexican salsas, period. This way, she could enjoy the pork (we made cubano sandwiches with the leftovers, one of her favorite meals) and I could enjoy it with my salsa. So if you are in a household with say, young children who might not appreciate the “icky green stuff,” this dish can still satisfy. I like to serve this pork over another childhood food, buttery white rice in which mixed vegetables are tossed in along with a little salt and lots of freshly cracked black pepper. We loved it whenever mom made it. I don’t eat white rice much at all these days but every once in a while, I crave this. Or maybe it’s the feelings it brings back of safety and nourishment on so many fronts that I felt growing up that I truly crave during these crazy times? 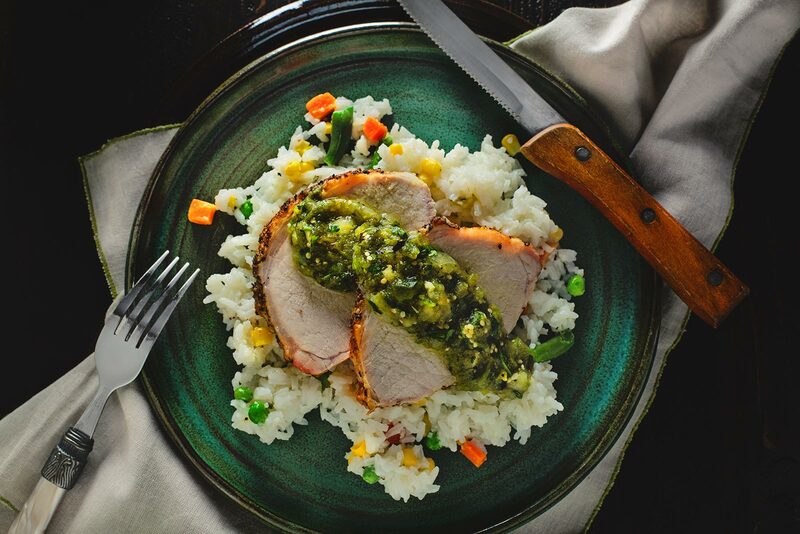 Whatever the reason, the buttery white rice serves as the perfect foil for the juicy pork and spicy tomatillo salsa. With the fork loaded properly – a little bit of pork, a little bit of salsa, a little bit of rice – creating that one perfect bite, all feels right in the world. At least while the meal lasts. Until next time, friends … ¡Buen Provecho! If your oven has only one setting for broil, ignore my timing below which is for a low broil setting and instead keep a close eye on the vegetables, flipping them when they start to blacken and removing them as soon as they are evenly charred. The serranos and garlic will char the fastest so they’ll need to be removed first followed by the tomatillos and finally the onion. Careful not to leave the tomatillos under the broiler so long that they burst, you want to remove them from the oven while they are still intact but dark olive in color with blackened tops and bottoms. The poblanos are best charred on a gas stove directly over the flame however, if you don’t have a gas stove, add them to the pan with the tomatillos. They’ll probably take as long to char as the onions. One hour before roasting: Remove pork loin from refrigerator. Place on a small rimmed baking sheet or roasting pan. Optional: Score the fat cap, careful not to cut through to the meat. Mix the salt, pepper, garlic powder, granulated onion and cumin in a bowl then generously sprinkle the pork on all sides. Reposition roast on pan fat side up; let sit at room temperature for 1 hour. In the meantime, make the salsa: Preheat broiler on low setting. 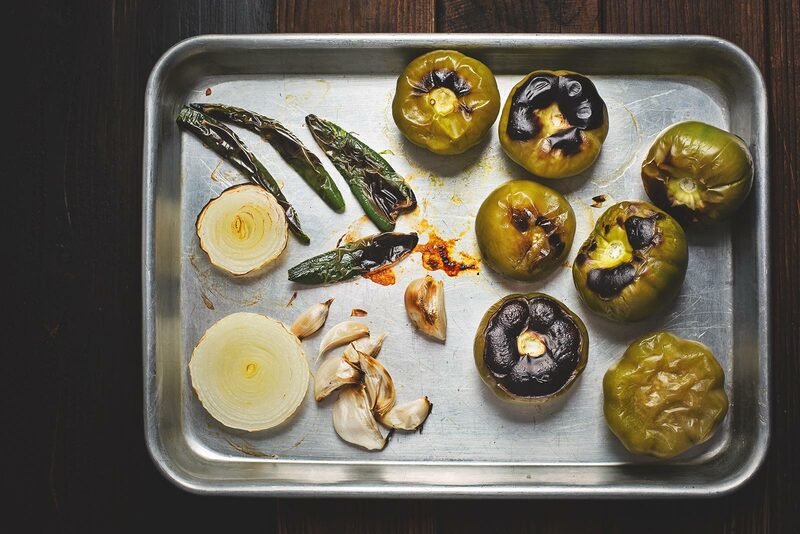 Place tomatillos, onion slices, garlic and serranos on a rimmed baking sheet. If you don’t have a gas stove, also add the poblanos. If you do have gas, set the poblanos aside for now. Broil the vegetables for 4 minutes. Flip the vegetables over; broil another 2 minutes, then remove the garlic and serranos to a small dish. Continue broiling the vegetables for another 4 minutes or until the tomatillos are dark olive in color with blackened tops and bottoms. Remove the tomatillos to a blender jar. Continue to broil the onions another 2 minutes or until well charred on both sides. Add the onions and peeled garlic to the blender jar. Cut the stems off the serranos and, if you want less heat, remove the seeds, then add the chiles to the blender. Add the cilantro, cumin and salt. Pulse 30 seconds to a minute, or until the tomatillos and onions have just broken down but the salsa is still chunky. Pour the salsa into a bowl. 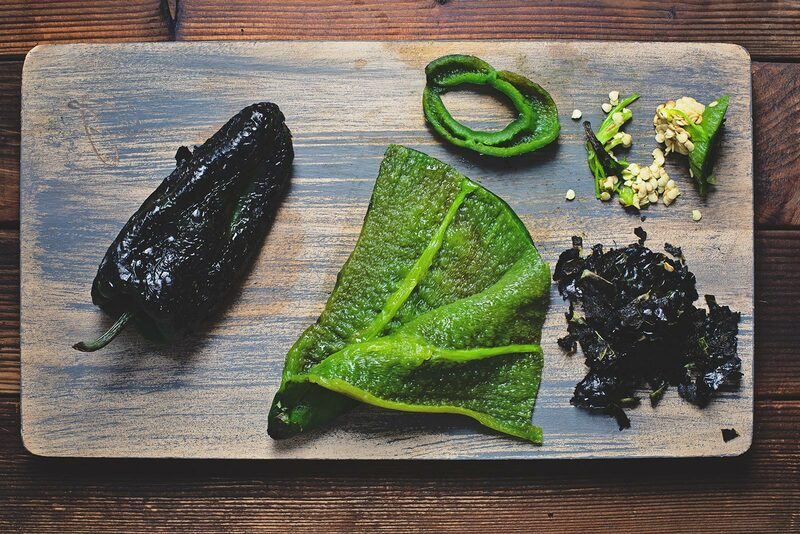 Place the poblanos directly on the flame of a gas stove to char, turning as necessary until the chiles are blackened on all sides. Place the chiles in a bowl and cover with plastic wrap; leave to sweat for 15 minutes then peel away and discard the blackened skin (for a less messy approach, use a spoon or the back of a knife to carefully scrape the skin away). Do not rinse the chiles; a few black flecks left behind is fine. Trim the stem tops off, then split the chiles down one side to open; remove and discard the seeds. Slice the chiles into strips then cut into ¼-inch dice. Stir the poblanos into the tomatillo salsa. Cover and set aside. Roast the pork: Set a rack on the bottom third of the oven. Preheat oven to 375 degrees Fahrenheit. 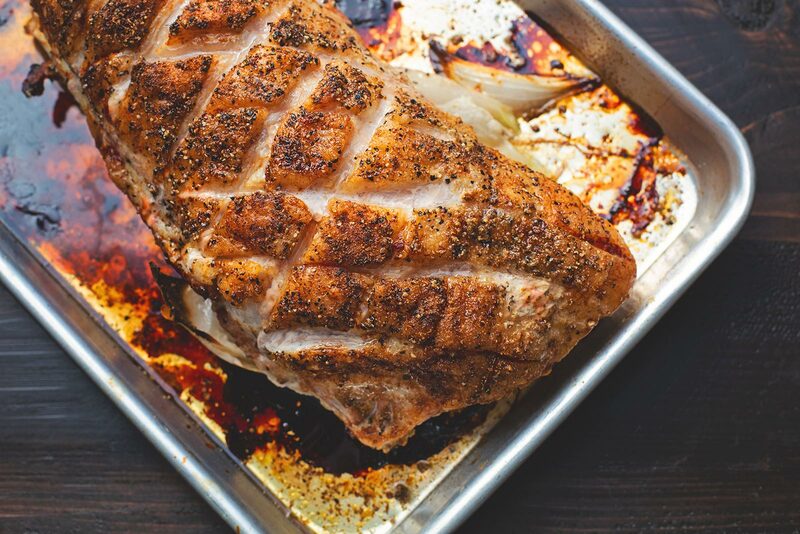 Roast the pork loin for 30 to 45 minutes or until a thermometer inserted into the center reads 140 degrees Fahrenheit. Remove the pork and cover with aluminum foil; let rest for 30 minutes (temperature will continue to climb while it rests). While the pork is resting, make the rice: Add the vegetables to a large measuring cup or bowl and cover with cold water; set aside to defrost. Put rice in a bowl and fill with water; swish the water to rinse well, dumping the water and repeating for three times to remove most of the starch. Place the rice in a sauce pan and add 2 cups of water, along with ½ teaspoon salt, bring to a boil then cover and reduce heat to low. Cook the rice for 15 minutes; turn off heat but leave pot covered and let rest for 5 minutes. Drain the mixed vegetables. Fluff the rice with a fork; stir in the butter and pepper and mix until butter has melted. Fold in the vegetables. Taste the rice and adjust seasoning as needed. To serve: Place a scoop of rice on a plate, top with two slices of pork then add salsa to taste. Leftover salsa will keep in an airtight container for up to a week in the refrigerator. Allow pork and rice to cool completely before covering tightly and refrigerating.